Potty training is a rite of passage every parent and child go through. The process can range from what nightmares are made of to a surprisingly easy transition from diapers to underwear. Most potty training stories fall somewhere in between, and the end result is still the same. Parents rejoice when they no longer need to buy diapers and children finally wipe their own bottoms—most of the time. Some children take a little longer and some need extra help at night. 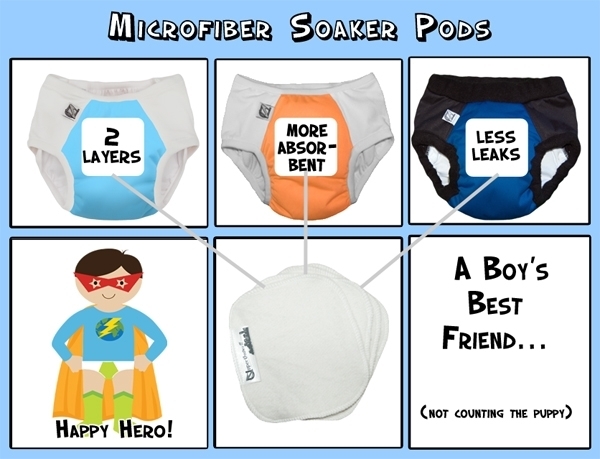 Super Undies will make your child feel like a super hero while they conquer potty training and bedwetting fears. The company Super Undies offers cloth, reusable potty training and bedwetting pants to help parents and children enjoy (or at least dislike it less) the transition from diapers to underwear. And Super Undies are a more environmentally friendly and cost effective way to get through it—with a lot of options. As my boys approach two years old, I know potty training is right around the corner. I am thrilled and terrified. Each I time I change a diaper, my desire to be done with them grows stronger. Could I have stuck with cloth diapers? Sure. But after a few months with twins, I just didn’t have the stamina; I have some guilt with the amount of waste the diapers created, though. Super Undies might save the day. These potty training pants are for the beginner. They can go from having the absorbency of a diaper to that of a pair of underwear by using inserts. Super Undies Potty Training Pants come in a variety of fun colors and as either a pull-on or snap-on trainer. The Hybrid Undies Shell allows parents to add multiple layers of microfiber inserts to adjust to naptime or long trips in the car. 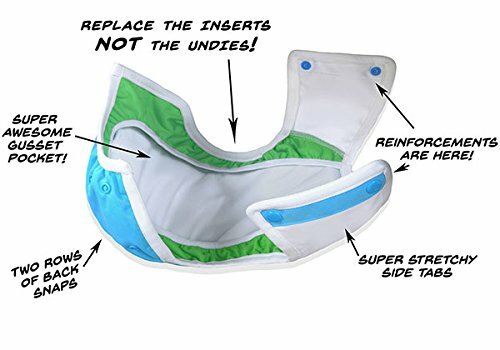 It also allows parents to reuse the shell over and over since you only have to replace the insert after an accident and not the entire pair of underwear. The Super Undies website also reminds parents that switching from underwear to disposables “can cause potty training confusion and delay the process”. While accidents will still happen, the hope is that once your child is more focused on their body and the security of a diaper is gone, potty training will go smoothly. The Potty Training Pants range from size Small to XXL, accommodating most 2-10 year olds—perfect for those who need more time or children with special needs. These trainers are for the ones still trying to get a handle on nighttime potty use. My daughter was great using the potty during the day, but until her body was able to recognize when she needed to go, she had accidents at night. We used disposable pull-ups at, but she resisted. After being in her cartoon themed, soft, cotton underwear all day long, she didn’t want to put on a boring and scratchy diaper. Super Undies offers colors and styles she would have loved and with soft cotton or microfiber inserts. The Bedwetting Pants range from size 1-4, accommodating most 3-10 year olds—perfect for heavy sleepers, times an older bed wetter wants to be discrete at a sleepover, or for children with special needs. Super Undies will give children the confidence and independence to learn how to use the potty without the fear of ruining their “big kid undies” or looking like a baby in front of friends or schoolmates. And Super Undies will save parents money and frustration with the ability to reuse them until their child doesn’t need the extra help of absorbent trainers. With all they have to offer, Super Undies will help children conquer potty training, leaving them dry and feeling like a super hero.